Picture yourself as you’re walking through a field of thick, golden colored grass with clumps of what appears to be cotton stuck to them. With each passing step, you feel the dampness starting to seep into your leather boots. A heavy blanket of wet snow has fallen that morning like a white sheet draped over the landscape. The weatherman was right for once. You’re excited to be hunting in the wintery snow. Easy to spot signs, such as pheasant tracks, leading you to the clown prince of the prairie. You’re starting to feel the effects of cold damp feet. You immediately notice “wet spots” on the toe of your boots. Not good. Wet feet, mean cold feet. The dog is starting to act birdy, but your toes hurt from the cold. You know the leather boots you’re wearing are only two years old. No holes or tears. Why are your feet cold and wet? Waterproofing and conditioning hunting footwear is probably the most si mple and essential boot maintenance tip, yet this is easily neglected by hunters. In the scenario played out above, when water no longer “beads” off of hunting boots, or your footwear is dry, brittle, and the leather is showing signs of being cracked then it’s time to revitalize your boots. 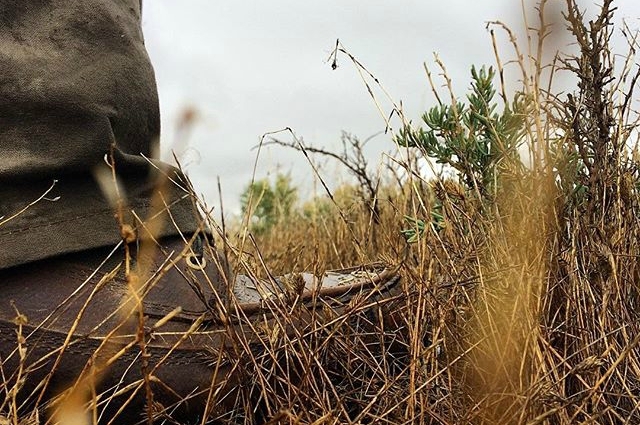 The performance of one’s boots is a direct result of how well hunters take care of them. Now that the bird season has come to an end across the country, this is the perfect time to inspect your boots for damage, tears, rips, and abrasions. It’s also the time to waterproof and recondition them. Keep the water out. Bird hunters traipse around in all manners of cover, terrain, and adverse weather conditions. From hunting along streams to walking in the snow, wingshooters need to be able to walk in all manners of damp conditions. Wearing waterproof boots is pretty much a standard among all hunters. Boots must be able to handle everything from the early morning dew, to total immersion when crossing a stream. The boots ability to shed off water and moisture will determine and have an adverse effect on how long one remains in the field. Wet feet can deteriorate a hunter’s ability to continue the hunt, mental toughness, and overall demeanor and attitude. Waterproofing plays a vital role in protecting and prolonging the leathers and fabric. Maintaining boots at their optimal level, adds to their durability, longevity, and will keep hunters in the field longer and dry. Most boots that come from the factory already “waterproof”, will at some point wear off or at least diminish its capability to keep out water. Therefore, it’s vital to waterproof boots. GORE-Tex is synonymous with waterproofing. However, over time, this waterproof membrane will breakdown. If there is no significant damage that would allow moisture to enter or seep into the boot, or there are no holes or tears, then maintaining the effectiveness of GORE-Tex is possible by re-waterproofing them. By applying a waterproofing oil, spray, or cream it can prolong the life of a pair of hunting boots. Be careful in using the wrong type of application to waterproof hunting boots. It may damage the quality and serviceability. Make sure to use products that are compatible to the material of the boots. Hunting mocs must be waterproofed regularly. Hunters should do some basic research to determine the best products to purchase. Regularly scheduled boot maintenance throughout the season is essential. Whether, one purchases water proofing oil or wax, they must be re-applied whenever it appears to be wearing off. Signs. When properly waterproofed, water beads will be observed running off the boots. Hunters should not let dry feet fool them into thinking that their boots are still repelling water. Footwear needs to be inspected, and if water appears to be absorbing through, then it’s time to reapply a waterproof seal. Water damage can be done to hunting boots and a visible sign of this is cracking in the leather. Most of the time, it’s due to over exposure to water and moisture with no follow up boot care to maintain the porous capability of leather. Condition Your Boots. Conditioning is NOT waterproofing. Conditioning is to “improve” the leather by providing the required moisture. Think of leather as your skin, and the needed moisturizer to keep it healthy. Conditioning hunting boots, adds “healthy” moisture (not the water hunters are trying to keep out), and restores the fibers. By maintaining and restoring the natural oils inside the leather, it makes boots more flexible and helps prevent them from cracking. Dryness leads to cracking and this leads to the breakdown in the leather, affecting the waterproofness and overall structure of the boot. Hunters need to remember to take care of their hunting boots, so that they last several seasons. Boots should receive a quick cleaning with a brush to take off dust, dirt, and mud after a hunt. Minutes of easy boot maintenance will prolong the boots life. Store boots in a cool, dry place. I hope that this quick guide will help in keeping your hunting boots in working order. I am no boot or leather care expert, but I know that with some simple upkeep my boots have lasted for several years, and will continue to take me into those upland places. Edgar Castillo is a twenty-two plus year veteran law enforcement officer for a large Kansas City metropolitan agency. Edgar also served in the United States Marine Corps for twelve years. Besides his faith and family, his passion lies in the uplands as he self-documents his travels across public lands throughout Kansas hunting open fields, walking treelines, & bustin’ through plum thickets.